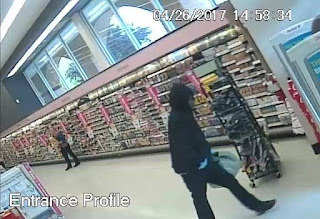 Surveillance images of two men suspected of robbing prescription meds from an Elk Grove Walgreens store were released this afternoon by Elk Grove Police. 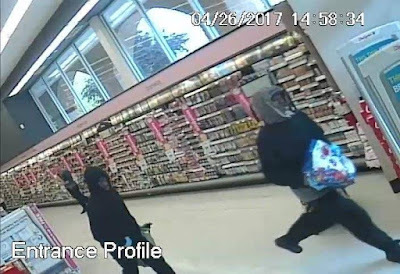 The two suspects are being sought after they allegedly stole prescription medications from the Walgreens store on Laguna Boulevard and Bruceville Road on Wednesday, April 27. The duo jumped over a counter in the pharmacy area, grabbed a female employee by the arm, and stole specific, though unnamed prescription medications. The first suspect was described as a black male adult, 20's, 5'8" tall with a slender build, wearing a black hooded sweatshirt, black pants, black shoes, and light blue gloves. The accomplice is also a black male adult, 20's, 5'10" tall with a slender build wearing a grey hooded sweatshirt under a black crew neck sweatshirt, black pants, black shoes, and light blue gloves. Another suspect, Miles Jacob Gates, 22, of Sacramento was arrested yesterday as part of the Walgreens robbery. Gates, who is on parole, was contacted during the investigation was found to be in violation of his parole, and the was connected to the two robbery suspects. Gates is being held at the county jail and is ineligible for release.